TPO Roofing: What Are The Benefits? Do you have a flat commercial roof that may be in need of a new solution soon? Single ply roof membranes are a very popular choice for flat commercial roofs, and with good reason. Durable, lightweight, and built to last, there are several options to choose from. Today we will talk about the benefits of TPO, one of the most durable single ply roofing membranes available. Which Roofing Material Is Best For Your Commercial Roof? First and foremost, everyone wants to know about cost. While the cost of a roofing installation will vary according to may factors, understanding how the cost ranks in comparison to similar roofing systems can help provide some perspective. TPO is looked at as a sort of harmony between EPDM and PVC, and the pricing reflects that. You will pay a bit more than you would for EPDM, but you will be getting many of the same benefits of PVC roofing at a much lower cost. 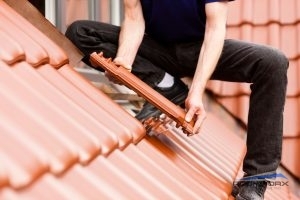 Another big benefit is the amount of energy these roofs can help you save. Often very glossy and applied in white, TPO roofs effectively reflect sunlight away from the roof’s surface. This allows the building to stay cooler in summer months, which in turn puts less strain on your building’s heating and cooling systems. That reflective surface also works to prevent a lot of damage that can be caused by UV rays, which extends the lifespan of the roof. TPO is also resistant o tears and punctures, and boasts thermoplastic seams that prevent water leaks. If you are interested in adding a TPO roof solution to your commercial building, or if you have questions about the other single ply roofing membranes we have to offer, give our team a call today at 817-964-9231 to get started! Posted in Uncategorized on December 21, 2017 at 5:12 pm by Roofworx & General Contracting. When Is a Commercial Roof Replacement Necessary? Find Out When You Should Get a Commercial Roof Replacement. 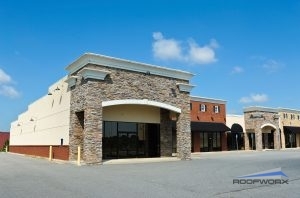 If you are a commercial property owner, you know how important your roofing is. Because of this, it is important to get a roof replacement when the time is right. But when is a commercial roof replacement necessary? There are many factors to consider when deciding if a commercial roof replacement is the best solution. Below are signs that indicate that you may be in need of a complete roof replacement service. No matter what you do, your water continues to pool on the surface of your roof after it rains. Water pooling might not seem like a big deal, but it can increase the weight on your roof, which has the potential for the roof to completely collapse. This is a big deal because it can cause water to get inside your building. Not only will this ruin the exterior of your roof, but it will ruin the interior of your building. Furthermore, it can get into the insulation of your roof. Depending on what type of commercial roof you have, a commercial roofing system is able to last between 15-20 or even longer depending on how well-maintained it is. A roof replacement might be necessary if your roof is older. Do you live in Fort Worth, TX and need a commercial roof replacement for your building? Call Roofworx & General Contracting today at 817-920-5974 to schedule an appointment. Our roofers are able to replace your roof with a better roofing system that will give you great protection and energy efficiency. Posted in Uncategorized on November 21, 2017 at 9:22 pm by Roofworx & General Contracting. Upgrade Your Roof Today With EPDM! Are you considering adding an EPDM roofing system to your commercial roof for the first time? EPDM roofing provides you with plenty of great benefits, and today we will describe the main things you need to now about EPDM commercial roofing. EPDM is very resilient in all kinds of conditions, and thanks to its large production sizes, it is often seamless. Count on a 20-year lifespan! 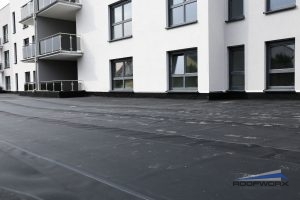 EPDM roofs traditionally use adhesive and then roll on the material to the surface of the roof, making it a quick and easy attachment process. Because EPDM roofing systems are one of the most commonly used materials for commercial structures, it is very affordable. EPDM is very reflective which will reduce the cost of energy fees in warmer seasons and keep warmer air in during colder seasons. An EPDM roofing system is a great choice because it is resistant to damages from heat, as well as rain or snow. An EPDM roofing system can provide your commercial building with more safety thanks to its long-lasting and weather impervious material. In order to get long-lasting EPDM roofing systems, the installations need to be performed correctly, that is why we only use the highest quality tools, materials, and certified roofing contractors to ensure that your commercial structure is safe, as well as the people inside. You can trust the roofers at Roofworx & General Contracting for your EPDM roof! We can begin right away with your new and improved roof when you call 817-964-9231 today. Posted in Uncategorized on October 16, 2017 at 6:27 pm by Roofworx & General Contracting. For Dallas, TX buildings, an energy bill spike in the summer can mean doom for your bank account. It’s also an indicator that your structure is not properly preventing heat from infiltrating the buildings interior. Because of the lengths and temperatures of Texas summers, constant exposure to harmful UV rays can damage your roof. Worse, they will cause your AC unit to work overtime and you will see a noticeable increase in your energy bills. Be alarmed if the top of your building reveals any plant growth, as that is a clear sign of a failing roof. The origin of these plants stems from improper drainage in your roofing system. Because of the excess moisture, an environment for plant growth has been created. Not only does this look bad aesthetically, but is a sign that further damage is on its way. 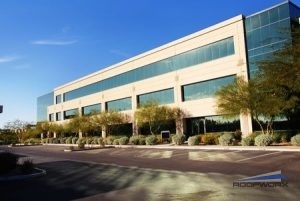 Commercial property owners should schedule roofing maintenance on a regular basis. Since it can be hard to see on the top of a building, rusting, chipping, and blistering can be hard to diagnose. If you do notice any of those symptoms, a roof coating or replacement could be in your near future. Call [nw_data field=phone] for all your commercial roof damage needs in Dallas, TX. Posted in Uncategorized on September 12, 2017 at 4:59 pm by Roofworx & General Contracting. Choosing the right flat roof can be overwhelming at first! Are you looking to upgrade your flat roof in the near future? Sometimes it can be difficult to figure out where to even begin with projects of this size, but the experts at Roofworx are here to help! Many of our commercial clients are concerned about making the best choices for their roofs, and in order to do so, you need as much information as you can get. Today, we’ll take some time to briefly go over a few important things to consider when choosing a new roof. With every type of roof, comes different benefits and environmental advantages. Consider your building, its age, and its location. Is it close to low-hanging trees, or shaded by other buildings, or is is taking direct sunlight throughout the day? If your priority is a roof replacement for the lowest price available, standard rubber roofing may be the most cost-effective option. If you have extra money to invest in your building, you might want to consider a white PVC roof, for increased durability, a longer lifespan, and increased energy efficiency. Are You Staying In The Building, Or Selling? If you plan to stay at this location for a long time, you need to think in terms of long term value. Is this roof going to last as long as you need it to? If you are looking to sell, consider how much value the new roof will add to your building. 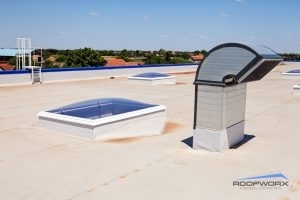 In some cases, flat roofs can be restored or even recoated, which can give you an additional decade to save for the flat roof you really want for the life of your building. If you have any additional questions about flat roof replacements in Dallas, TX and the surrounding areas, give us a call today at 817-920-5974! Posted in Uncategorized on August 9, 2017 at 5:06 pm by Roofworx & General Contracting. Commercial clients have to consider different options when it comes to flat reroofing in Fort Worth, TX. First of all, decide what you want. Commercial clients with flat roofing have the advantage – so many flat roofing options and all of them have multiple capabilities of saving you money and energy in the long run. Choose a roofing company that can offer you multiple kinds of flat roofing styles, allowing their workers and experts to advise you on more than one choice. Once you’ve decided which kind of roof you want, remember that you don’t always have to go for a complete removal and replacement of your current roof. In fact, a re-roofing or roof-coating may be the only thing you need. Talk to officials at Roofworx about new roof coatings and re-roofing or roof replacement options. You could keep your roofing membranes exactly as they are and simply spring for a new rock layer or coating, saving a ton of money and time. When you begin a new roofing project be sure to cover all your bases. Commercial flat roofing needs specific maintenance work done, often and when a roof has reached the end of it’s life, Take the right steps to ensure the new roofing material or coatings will adhere. Roofworx has all the tools needed to repair and install flat roofs. Roof vacuuming is the answer to roof rock removal, but many commercial business owners don’t know they need it because many local roofers can’t offer it. Flat roofing is an efficient, money saving roofing style, but unfortunately many roofers don’t use the equipment needed to properly, install and adhere flat roofing. Roof rock needs to be removed before any sort of re roofing or new roof installation can take place. In the olden days, a group of roofers would shovel the rock away, but for commercial roofing, where roofing square footage is vast and time is limited, it’s better to have roofing professionals with Roofworx take care of your roof vacuuming troubles. Call 817-920-5974 to speak with experts about flat reroofing in Fort Worth, TX. Posted in Uncategorized on July 7, 2017 at 2:19 pm by Roofworx & General Contracting. Tile Roofing: What Are The Benefits? When it comes to choosing the perfect roof for your home, you are left with more than a few options. However, if you are looking for style and iconic durability, look no further than a tile roofing option! Tile roofs are an investment that pay for themselves! Designed to last, tile roofs are some of the best roofs for withstanding storm damages, as well as the tests of time. In fact, tile roofs can last over 100 years, and have even been known to outlast the buildings they are installed on! The tiles are resistant to high winds, and even impact from flying objects and hail. They boast a Class A fire resistance as well, and last 2 – 3 times as long as a traditional shingle roof! Tile roofing is luxurious and classic. You can buy it in a variety of different styles that range from materials to colors. Available most classically in clay or ceramic, you can also find roof tiles in concrete and slate if you prefer. From Spanish red tile to subtle earth toned tiles, you can choose a traditional or exotic aesthetic for your home. A big reason tile roofing remains so popular despite the expensive initial cost, is that this roofing style is incredibly energy efficient. Tiles are resistance to heat absorption, and they keep heat and cooler air in your home, according to how you have your air conditioner or heater set. 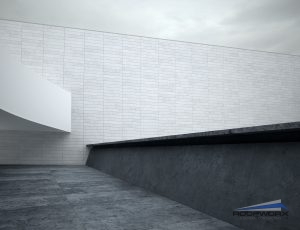 The tiles are also typically designed in a way that allows airflow that creates a heat transfer barrier. This helps your home stay cooler in the summer and warmer in the winter as well. If you are interested in learning more about roofing options, call us today at 817-920-5974! Posted in Uncategorized on June 6, 2017 at 8:44 pm by Roofworx & General Contracting. If you’re constructing a commercial building, you’ve likely considered a flat roof. Many people will harp on the lack of drainage as a serious drawback, and fail to see all the advantages that flat roofs offer. To make an informed decision, you’ll want to consider the good with the bad, and weigh the benefits of flat roofs over pitched alternatives. A flat roof is much less expensive than a pitched one. From the initial construction of the building, to the final placement of the roof, you will save plenty of money if you go flat. The materials used to cover a flat roof generally run less than a dollar a foot. Installation aside, the care and maintenance of flat roofs also comes in cheaper than pitched. 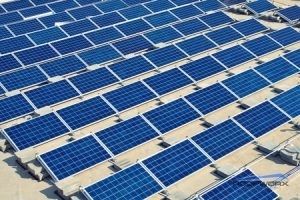 Among other advantages, flat roofs provide a convenient location for solar panels. Flat roofs also provide a builder with extra space to store large items. Air conditioners, for example, can get placed on the roof, along with solar panels. If you’d like to create an outdoor living space, flat roofs provide an ideal opportunity. In the same vein of the preceding example, flat roofs allow you to maximize the advantages of your upper floor. Instead of the odd angles created through pitched roofs, you have a totally open space for lofts or finished attics. Should you ever have a problem with your roof, or need access for whatever reason, flat roofs provide greater accessibility than pitched. Once on the roof, a flat roof also serves as a much safer space, with less chance for accidents. Need a flat roof in Fort Worth? Call the experts at Roofworx and General Contracting at 817-920-5974. Posted in Uncategorized on May 4, 2017 at 4:52 pm by Roofworx & General Contracting. 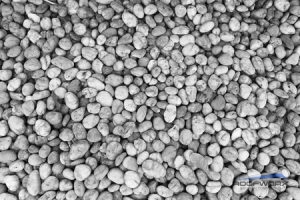 Traditional Ballast Removal – The traditional method of rock removal is to shovel the dirt, gravel, and rocks from the surface of the roof and transport it away on wheelbarrows. It is a time consuming and labor intensive process to clean a roof this way. Dry Vacuum Method – Skip the shovels to reduce the time and cost to get your roof cleared by requesting dry vacuum rock removal. This is a fast and efficient way of clearing rocks and gravel from a flat roofed building. It also reduces the risk of damaging the roof membrane since it requires less people and equipment on the roof. Wet Vacuum Method – If you need a roof cleaned that is in poor condition and is caked with dirt, using wet vacuuming will ensure that your roof is 100% clean. Wet vacs remove all the gravel, dirt build up, and ponding water on the surface of your roof. If you need roof ballast stone removed in Fort Worth, TX or Dallas, TX then contact the roofing specialists at Roofworx today at 817-920-5974! We will help you determine the best method for clearing your roof and ensuring the surface is completely clean for a new membrane or roof surface. Posted in Uncategorized on March 29, 2017 at 7:23 pm by Roofworx & General Contracting.